Child care providers, educators and teachers around the world love and use their private Kinderloop's every day to create simple, secure and effective documentation saving time and money doing so, building a responsive learning community! We listen to every one of our Educators taking their feedback on-board to make Kinderloop better for all, its all about helping you achieve better educational outcomes everyday. 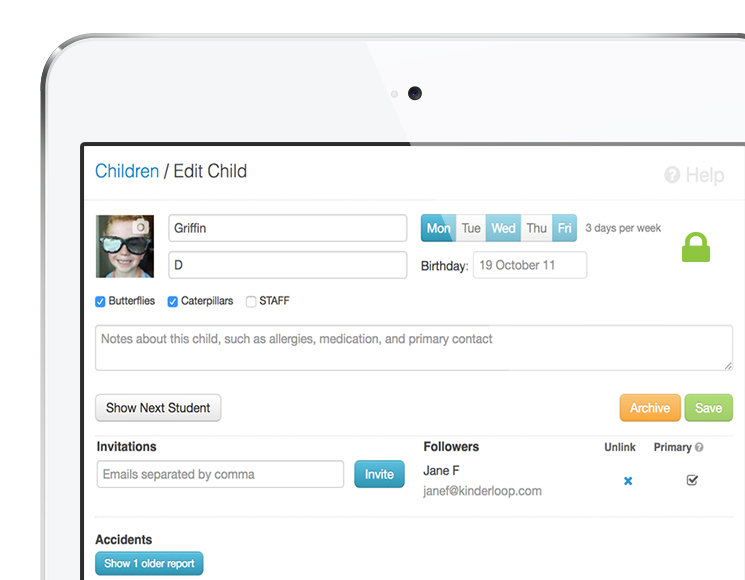 Kinderloop is one of the only documentation tools to place educators in full control. All content created in a private Kinderloop is owned by its creator and family invites to a private Kinderloop are fully controlled by the educator ensuring complete privacy. 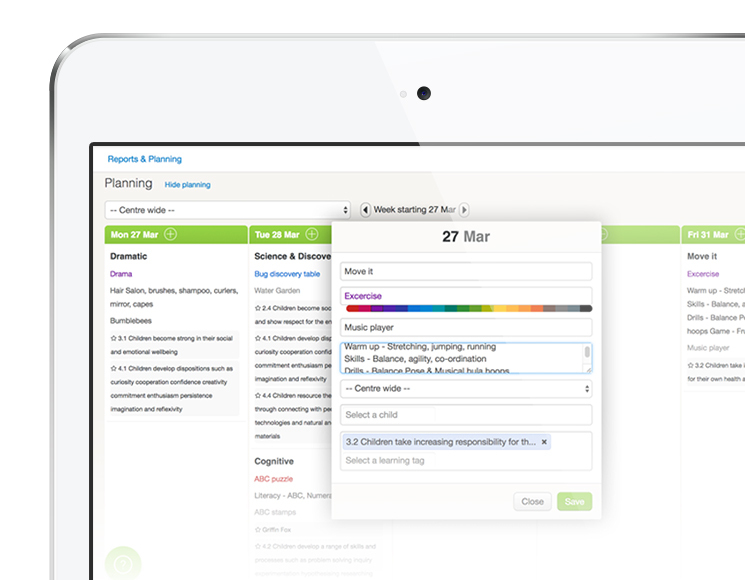 Use Kinderloop's versatile planning to programme in advance or as you go. Multiple planning walls allow for a more holistic, free form way to plan that can also be shared with family. Plan with your choice of learning outcomes, goals and philosophies. Select an existing EY framework, adapt one, or create your own to fit your way of reporting. We understand that every educator reports differently, Kinderloop's flexibility allows you to shape and mold your private Kinderloop to how you want it. During your setup, our experienced educator help team are with you every step of the way. Certain additional features such as accident reports, daily activities, parent posting can be switched on at any time as you need them. 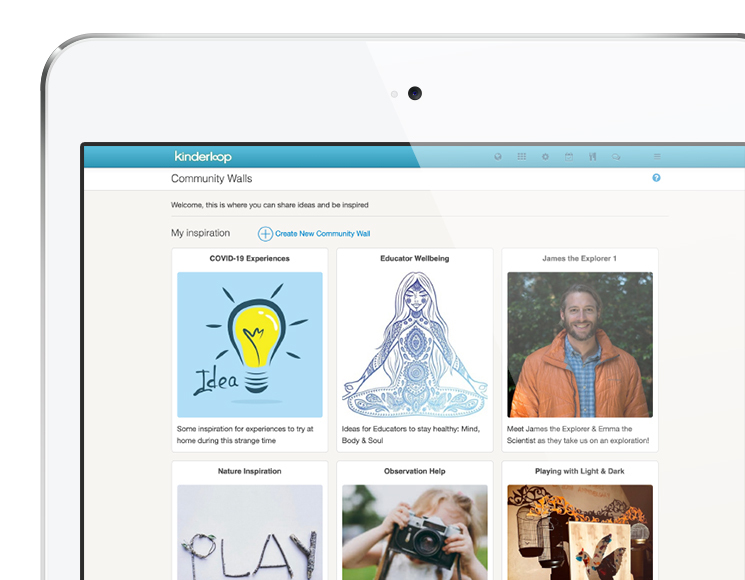 Update your linked family members with specific posts, notices, events, reminders, video or group stories. See responses from families - immediately! 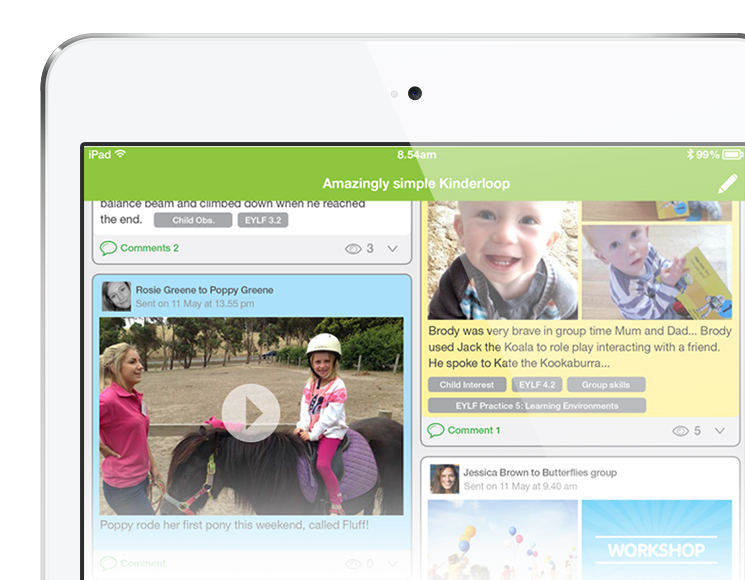 Over 1.8 million learning stories have so far been created in private Kinderloops. 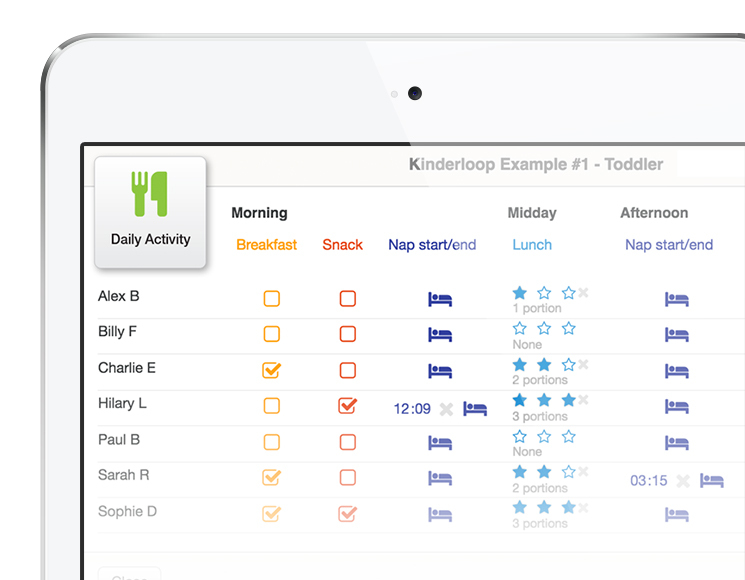 Kinderloop is free for families to access their child's activities. Keep track of those little accidents, easily and efficiently within your private Kinderloop and change the template as required. Educator and parent signatures are completed effortlessly online, saving you time. In any early childhood setting, educators need the ability to capture moments as they happen, without thinking. Kinderloop's simplicity gives you the freedom for more eyes on time, knowing that your documentation is taken care of. Your private Kinderloop can be accessed on any device, wherever you may be, handy for those times when a follow up just has to be written down while you remember it! 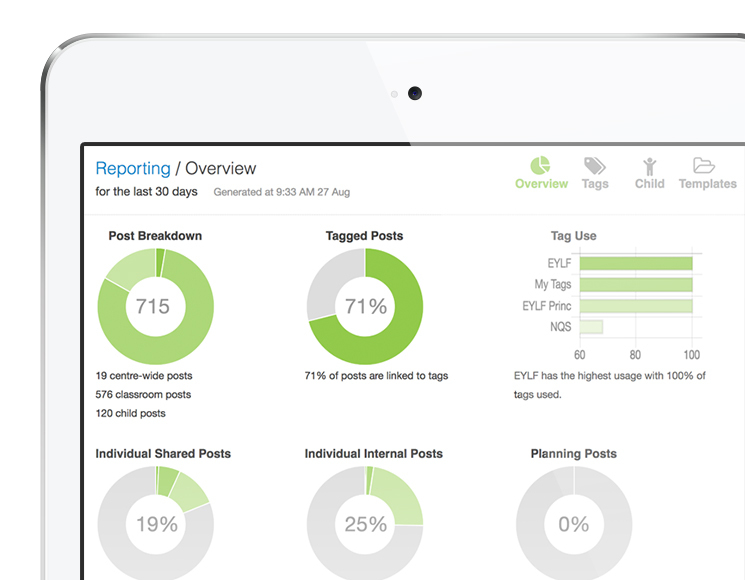 Create your own daily activity charts that can be accessed and completed by your staff. Record eating habits, arrival times, happiness and sleep times all in one place, linked family can access their child's info in real time. We offer professional development and provide on-going support for all of our Kinderloop family. 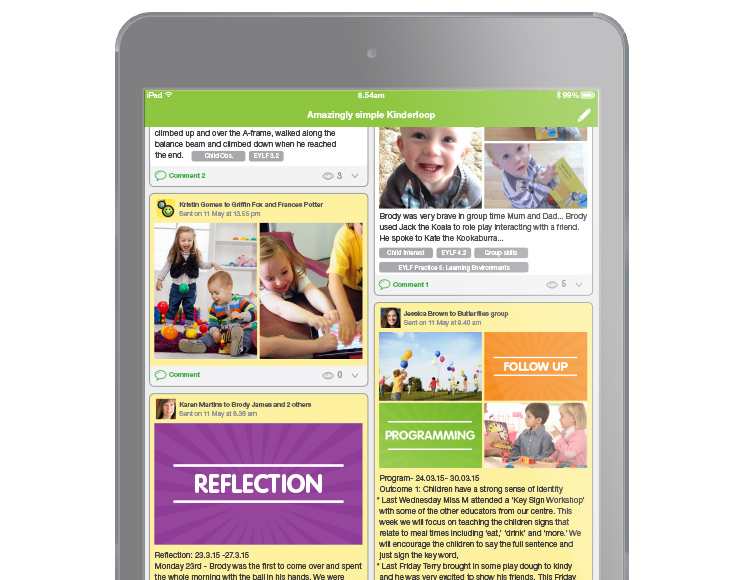 The Kinderloop educator community forum offers hints and tips, not only with using your Kinderloop but with ideas and thoughts from the world of early education and pedagogy. Engage with your securely linked family members like never before. Allowing family to post back to your private Kinderloop gives you the chance to incorporate their experiences into your weekly planning cycle. Over 50,147 parents posts have so far been incorporated into educators private learning cycles! 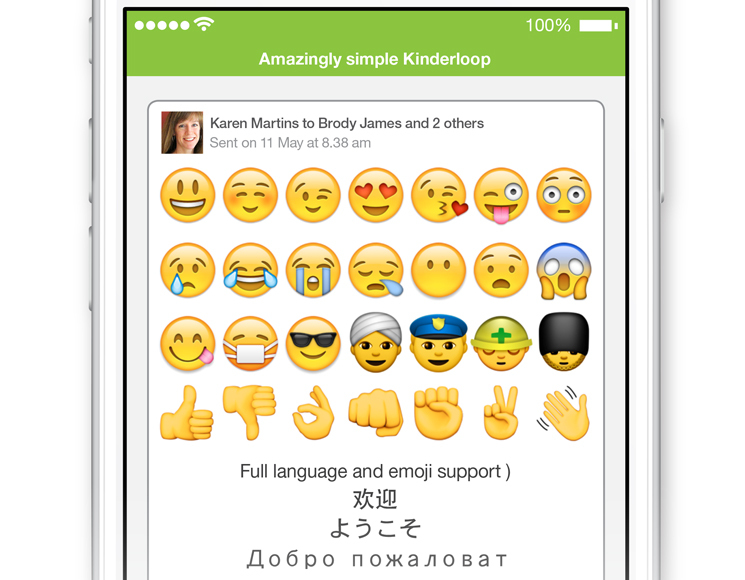 Your private Kinderloop is multi-language ready allowing you to communicate with linked family in any language! We even support a large range of emoji's so you can add that little extra fun to your communication. Keep your documentation up to date with powerful reporting! Whether it's keeping tabs on a particular child/learning outcome or creating a summative assessment, its beautifully simple with Kinderloop. 5. Post to your private kinderloop! Simple!! Child care providers/educators post updates to their private Kinderloop on a web enabled device or via a computer. Posts consist of photos, news, developmental outcomes, anything that relates to the child/ren. 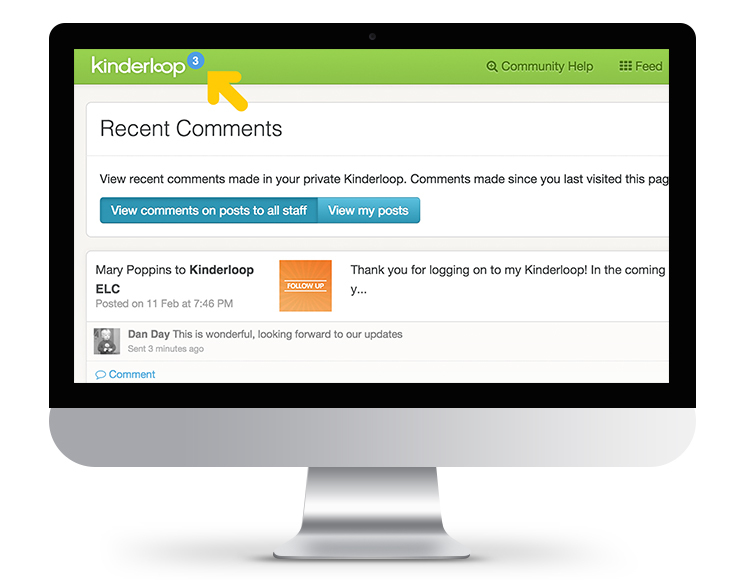 Kinderloop automatically and securely posts the updates to the child's linked parents. Parents can securely login to see all of their child's updates either via the free app or on the web. As a teacher, how do I start? We are constantly making it easier to setup your private Kinderloop - we realize that it will take a little effort to add your children and invite their family members. This is one reason we make the first month absolutely free. 1. First time setup, choose someone to act as an administrator (for setting up a center for the first time) On a web browser, go to www.kinderloop.com and click the signup button to enter your center's details and create your private Kinderloop. You can add staff, children and invite parents in the settings screen. 2. Search in your app store for 'Kinderloop Plus' and download the free app to your iphone, ipad, ipod touch or android device. 3. Signin with your username and password on your device or web browser, this will link to your private kinderloop. Ask your administrator for these details if you do not have them. 4. Start creating your posts. 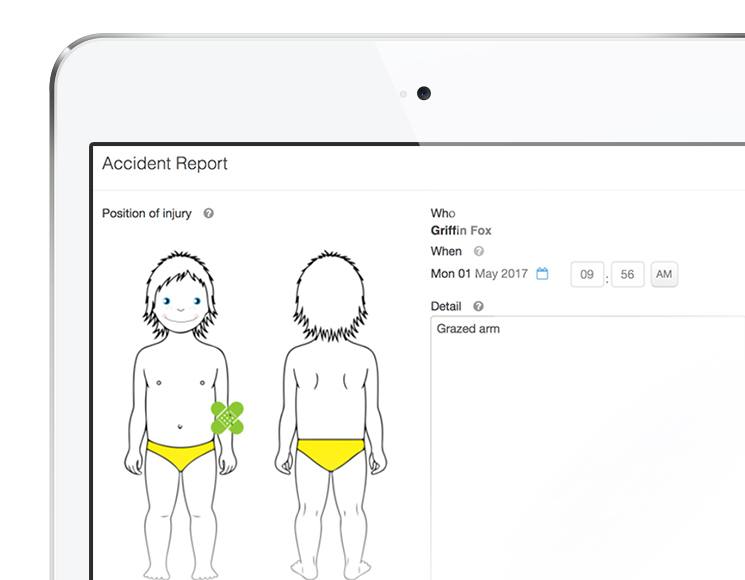 Use photos and text to record events as a care provider, tag groups and children; each child you tag, the family members linked to that child will be updated immediately. Use 'other tags' to easily link your observation to a specific learning outcome. How do I use the search function to report? A tag is a special kind of link. In Kinderloop there are 2 kinds of tags. 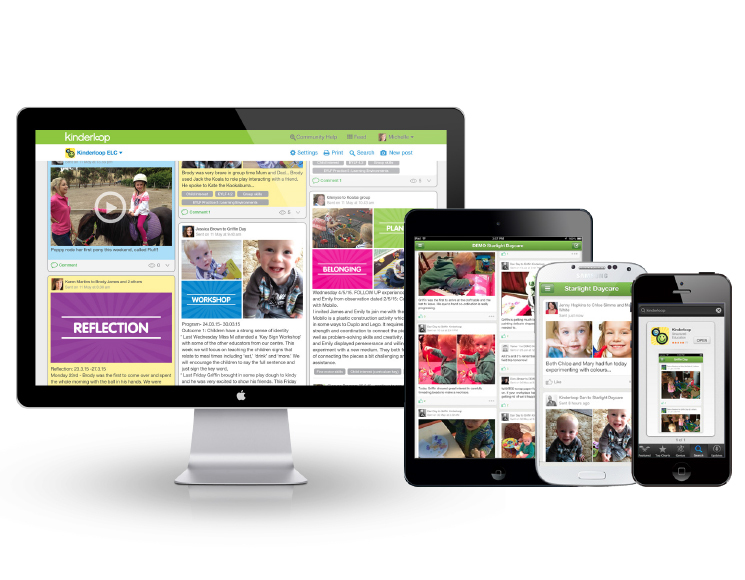 When you 'tag' a child, you create a link to them so that Kinderloop knows which parents to send the update to, the family linked will be securely notified that there has been an update. 'Other tags' are where you can create quick links to your developmental outcomes such as EYLF, EYLS etc. The search function (in your online settings) allows you to search on any criteria; children, observation tags, staff, dates. The results can be used to form developmental learning outcomes & documentation for each child. As a family member, how do I start? Family members will receive a secure email invite from their child's educator, click the 'Accept Invite' link in that email and choose a username and password that you can remember and click 'Signup'. If you have multiple children, 'Signup' with the first email and with the subsequent invites, accept the invites and 'Link' with your username and password from the first child. 5. Secure and private. Your Kinderloop is a private closed loop!